Their answers will pour fourth, and as they do, it’s a given that Sarah will be thinking back on how her own summer turned from burden to blessing. “God redeems everything for his glory,” she says, speaking about the most recent spiritual U-turn in her life, and how she moved through it. This past spring, when Sarah and her husband, Mike, learned they were expecting a baby, and that it was due to arrive in August, they were overjoyed. It would mean forgoing a long-awaited mission trip to Africa, but a child would be worth it. Then the baby died, and their summer calendar suddenly began to look very different, with three months of open spaces, painfully reminding them of their loss. 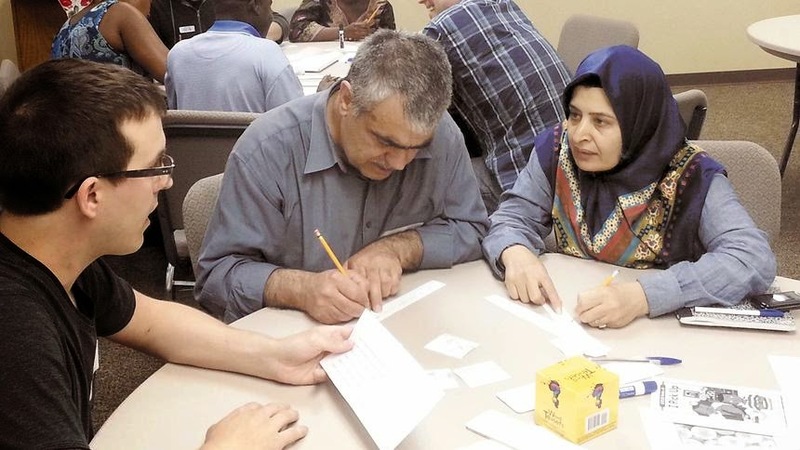 Even as she grieved, an idea came to Sarah, she says, and within a relatively short amount of time, she’d set in motion a program to help New Americans learn English and encourage them in their Christian faith through the summer. In a symbolic way, Sarah did end up giving birth – through her efforts to lead up the Master’s Heart Ministries’ English as a Second Language program, housed at Bethel Evangelical Free Church in Fargo. And with assistance from a volunteer team, which transpired rather quickly and miraculously, according to Sarah, she brought new life to many who’ve come here from somewhere else, often fleeing from dire circumstances. Ultimately, that life returned tenfold. In fact, Sarah says she’s been mourning summer’s end. After all, the program’s meant not just to build language skills but relationships, too. “I have loved the freedom to go and spend time at these people’s homes,” she says, noting that she recently shared a meal with some of the participants, whom she now considers good friends. Then, Sarah breaks into a story about Gakwaya, one of the participants. “When he started class, all he could say was ‘Hi,’ and he would nod and make motions,” she says. Steph Haugen, one of many volunteers who helped organize and carry out the initiative, says it was a privilege to be part of the program’s launch. Victoria Babingui, a mother of two young children from the African Congo, showed up faithfully every Wednesday to take part. While learning English through picture blocks, dry-eraser-board demonstrations and praying with her tutor, she also learned Bible stories, which were incorporated into the lessons. Meanwhile, her children were occupied in another room with other kids, also learning about God and their new country. But Sarah says she’s the fortunate one. At one point in the summer, the volunteers learned it was Babingui’s birthday, so they brought a bouquet of flowers to class for her. Babingui, however, wanted to gift them, and prepared African donuts, sambusa and lasagna for everyone to enjoy. It brings Sarah back to a time several years ago when she had a chance to do mission work in Mozambique, Africa. “No matter what (the African people) have, they’re always willing to give it,” she says. If they have little, they will give that. If they have much, they will give that. And, it seems, what comes around goes around. Just days before the first day of school, Sarah sits at her kitchen table admiring a bouquet of flowers – purples, pinks, yellows and red – representing her beautiful summer. The gift came from another of the program participants, a young African woman who, in light of being orphaned, is now mothering her five siblings. “Even while needing to be blessed, she chose to bless others,” Sarah says, in awe and gratitude.